We've said it before here at homify and we'll say it again: lighting is your household's best friend. No matter the state of your furniture, interior outlay and overall décor, a well thought out and brilliantly selected variety of lighting can be the make or break ingredient to the aesthetic success of almost any home interior. Different lighting, whether it's artificial or natural, can have such a profound impact on the overall livability, desirability and functionality of a domestic space, so it ought to be given a lot of weight when it comes to the overall mix of design factors considered in a remodelling job or renovation. When it comes to artificial lighting, there are a range of different factors and elements to consider, some of which include placement, style, source and direction, and all of which can be worked with, tweaked and refined in order to create the most optimal and inviting domestic interiors possible. Today on homify, we are once again shedding the light on fabulous home interiors that achieve fantastic results with a bright and aesthetically desirable choice of lighting. Take a walk through, get inspired, and generate a few brilliant light bulb ideas of your own! Of all the things to consider when it comes to artificial light, the first and perhaps most crucial is that of placement. It's all well and good to select a fancy fitting or range of fashionable, cutting edge Edison bulbs for the living room, but if you haven't given thought to exactly where you're intending to place them, then you may not end up with the results you prefer. Lighting can enhance, or diminish, the mood of any domestic space, and the lighting placement can directly determine this. In this regard, it's a good idea to take good appraisal of your spaces, and consider the sort of mood and feel you'd like to induce within them. Here's a fantastically appointed open plan living room with an amazing sense of vibe, mood and feel. Yes, the furnishings, outlay and overall design are fabulous, but it's likely that they wouldn't achieve anywhere near the same effect without such an engaging and energising array of well-placed lighting fixtures. This open place space lends itself well to bright, mid- to high-wattage LED and halogen ceiling fixtures, with feature down lights providing an ample spill of artificial illumination. Dimmable fixtures can provide further versatility, for those moments when you want to bring down the tone and mood a little, and make your space that little bit more romantic. Consider placement first and foremost, and work your way to style and quality from there. Lighting can be one of those ultra-tricky home interior additions, and knowing where to begin can easily provide a few headaches to begin with if you're not quite sure how to go about it. For a little extra advice and guidance, why not chat to a professional about how to get started? Once you've considered your lighting placement, you might consider thinking about the style of lighting and lighting fixtures that you intend to employ in and around the home interior. A bold splash of multiple fixtures can be great for inducing a sense of energy and vitality in a living area, but not all homes will demand that sort of treatment. Sometimes, less is more, and that's certainly the case when it comes to interior illumination. For rooms that require a softer touch and a more refined treatment, statement lighting pieces can provide the perfect addition. As we see here in this fine example, a single, well selected and creatively designed feature lighting fitting provides a decadent and delightful interior addition: indirect lighting such as this is perfect for a more sombre, sultry and relaxed feel, rather than the brighter and sharper quality of direct lighting. Lighting need not always be a predominantly functional interior addition: aesthetics are crucial to the invocation of a well-balanced interior mood and feel, and ought to be embraced in that capacity. Instead of limiting yourself to traditional placements and styles, it's a good idea to think outside the box a little and illuminate spaces that might not normally receive this kind of attention. Here's a great and effortless example of what's possible: a row of strip lighting embedded beneath an artfully designed stairwell handrail: it leads the way, providing a beautiful aesthetic statement, while shedding a delightfully laid-back and sultry light on the wooden floorboards. Clever and very enticing. 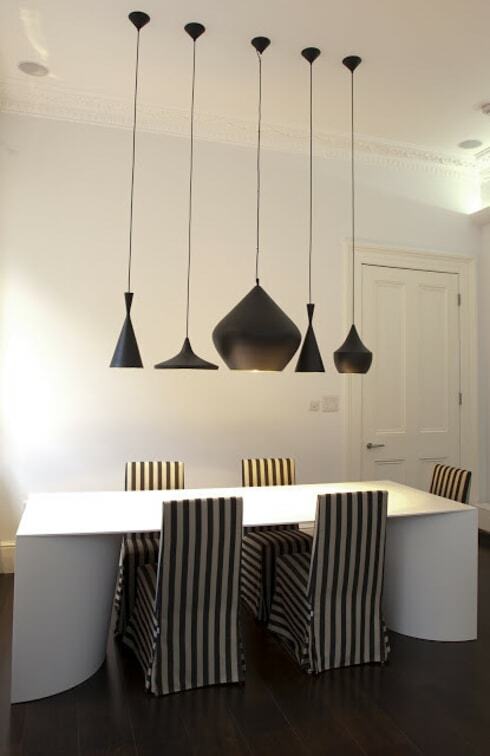 In other instances, a certain room or space may demand a brighter, more direct array of lighting in order to induce the desired effect, and when it comes to the dining table or communal entertainment spaces, direct lighting make for an ideal inclusion. 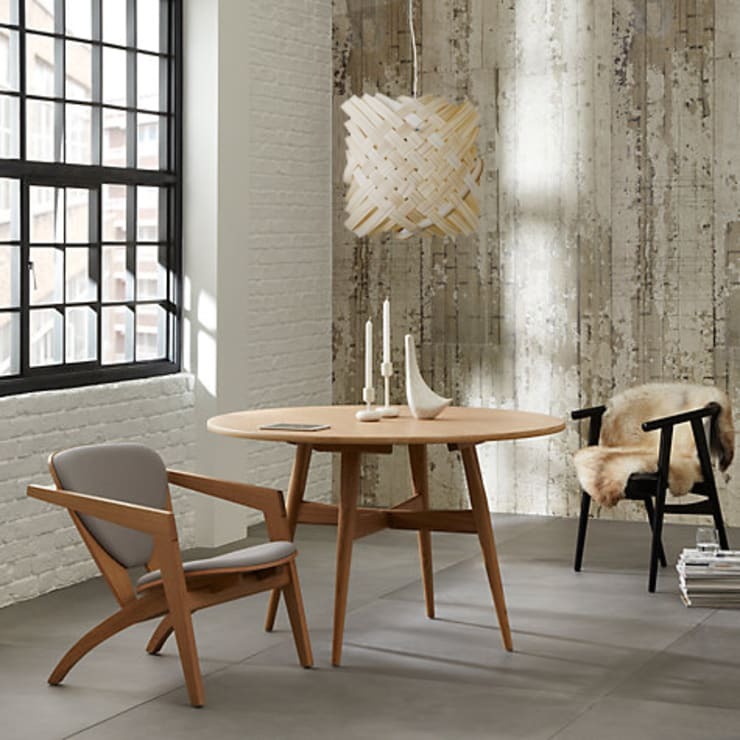 Here, we see the virtues of direct lighting at work: unlike the softer approach of indirect lighting sources, this array of five artfully designed and well-selected ceiling down lamps shines more than adequate light on this dining room table set up. You can easily imagine a dinner party here: food and wine well-lit thanks to good placement, without being too gaudy or harsh on the eyes. A mild addition of indirect lighting in the top corner brings an element of softness to the rest of the space too, a fine example of blended light qualities. Today, there are so many different types and styles of lighting available, with a range of non-traditional technologies on offer to keep our homes well-lit and looking fantastic. 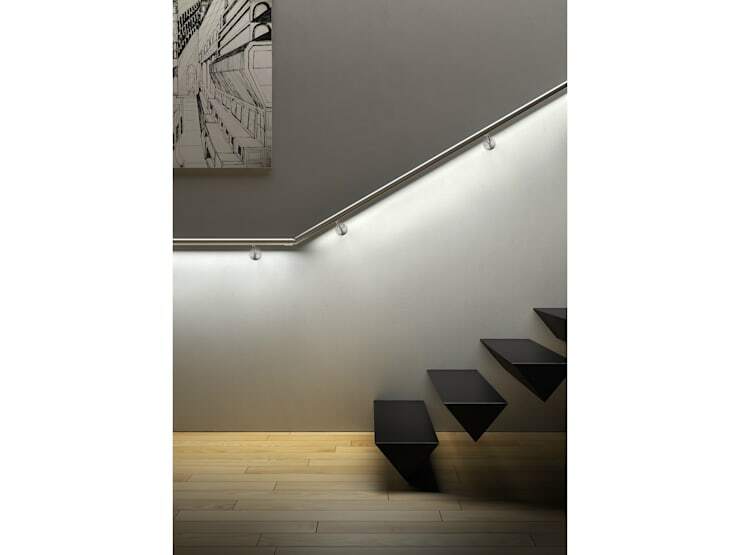 Bold and brilliant lighting has always been associated with 'the future', and if you're looking to induce a more progressive interior approach to your domestic settings, why not consider the full range of options on offer? 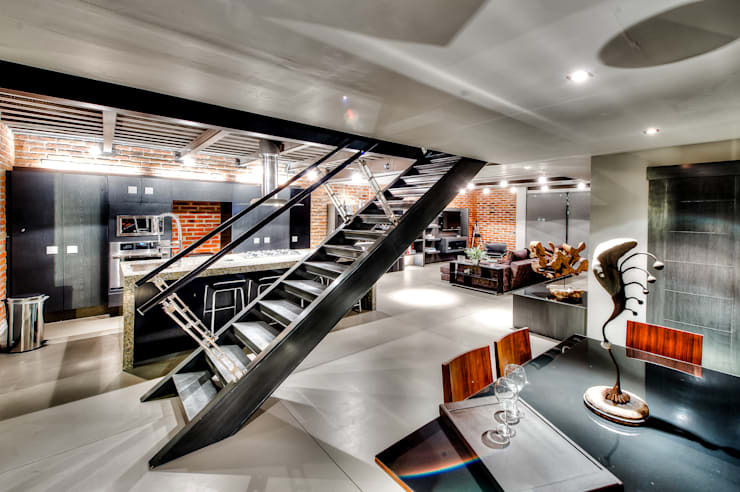 Futuristic home lighting can really take your spaces to the next level. For a fantastically futuristic, modern and almost science-fiction-esque aesthetic, consider strip neon and LED lighting, and embedding your lighting sources in unusual nooks and placements. 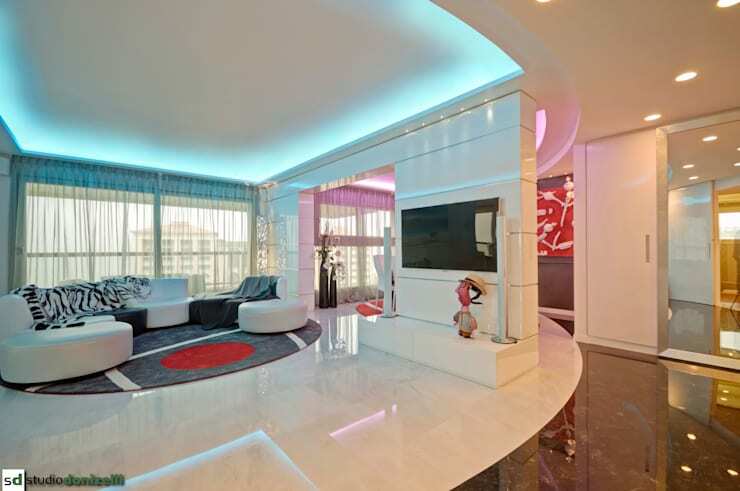 This fabulously pink modern artistic interior benefits from a decidedly futuristic treatment: neon blue indirect ceiling rims, working with the fabulously Cadillac pink hues of the adjacent living room. Of course, all this talk of artificial lighting is all well and good, but the fact is that in the daytime, there's only so much that this type of lighting can achieve for instilling a sense of invitation and allure to a home setup. No matter what room you're working with, it's a great idea to mix up your light sources, and having good access to natural lighting ought to be a significant priority. Here, we see just how effective and aesthetically pleasing a burst of natural light can be on a living area, and the importance of mixing it up: a well positioned window with streams of natural daylight, with a blend of table candlelight and feature ceiling light at the ready to provide a more relaxed, romantic setting come the evening hours. Did you enjoy that Ideabook? Why not keep the bright ideas flowing with a look at Lighting that begs to be noticed?